Tourism Radovljica have come up with a great idea for a new Hop-On Hop-Off tourist bus which will travel between Bled, the Šobec campsite, Radovljica, Begunje and Kropa. The bus will make stops at places of interest along the route and will make four circular journeys every Tuesday and Friday during the period from 1st July to 23rd August 2013. So now, even those without a car, will have the opportunity to visit some of the hidden delights in this area, get away from the usual tourist hotspots and see some of the places I have blogging about too! The weather has been gorgeous all week; swelteringly hot and sunny – just as I like it! I have been hiking, riding my bike, or a combination of the two, most days. There’s no shortage of places to go when the weather is so great, the only difficulty is choosing where to go. If I’m short on time, a favourite bike trip is the slightly longer variation of the Sub-Alpine Cycling Route (http://www.radolca.si/en/podgorje-bicycle-path/) which in part follows the road from Begunje beneath Mt. Dobrča, and offers spectacular views across the valley, then leads downhill through the village of Leše before returning via Brezje to Radovljica. For a longer ride, I often continue on the road under Mt. Dobrča, which eventually leads down to Tržiška bistrica then return via Kovor, Podbrezje, Posavec, Črnivec and back to Radovljica. 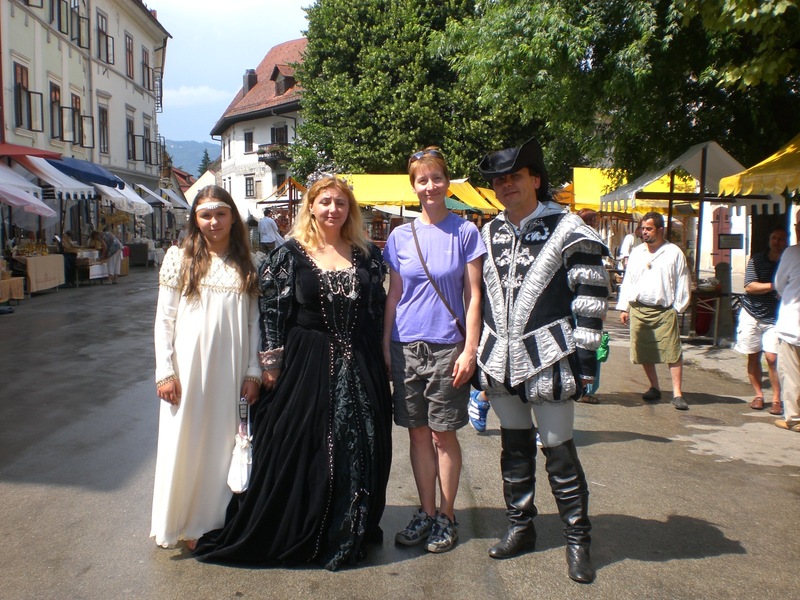 On Saturday, I visited Škofja Loka where the annual Festival of History was taking place. The beautiful old town centre was transformed into a medieval wonderland for the day with locals dressed in traditional clothing, stalls selling various wares and numerous workshops and performances. After that I took a walk up past Loka Castle and followed part of the Three Castles Path (Pot treh gradov), which I wrote more about in a previous blog ‘A rude awakening’ (March 2013). On the way back home, I stopped to visit the Potato and Sausage Festival in Šenčur. 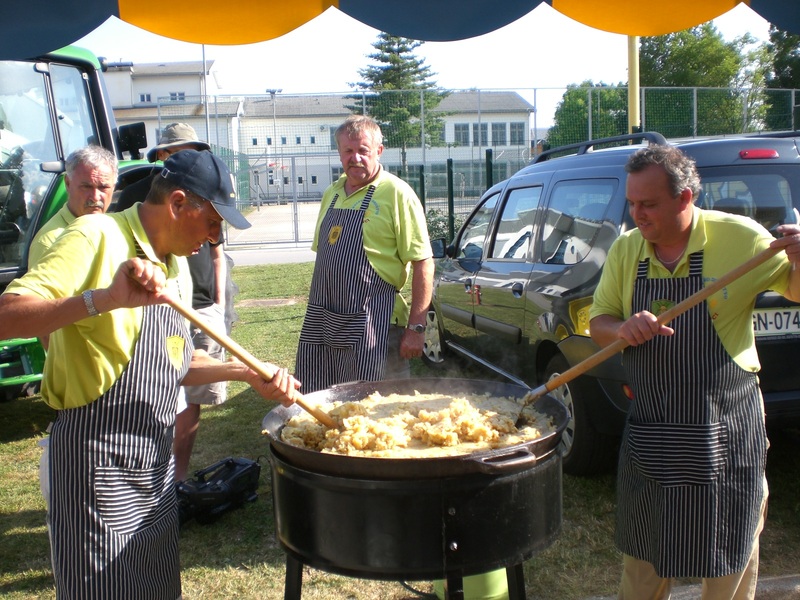 The village of Šenčur is synonymous with the potato and both potatoes and sausages, eaten alone or in a number of hearty stews and other dishes, form a staple of the Slovene diet. There were stalls offering, of course, a variety of potato and sausage dishes as well as some selling handicrafts. However, the event really comes to life in the evening when the live music and merriment begins, with just a glug or two of schnapps to make it even merrier! It’s hard to believe, but yesterday was already Midsummer’s Day and therefore it was the annual Midsummer’s Eve bonfire which is held at Kamen Castle in Begunje. It doesn’t feel like 5 minutes since it was winter – can it really be mid-summer already? However, at least the occasion is always celebrated in style here. 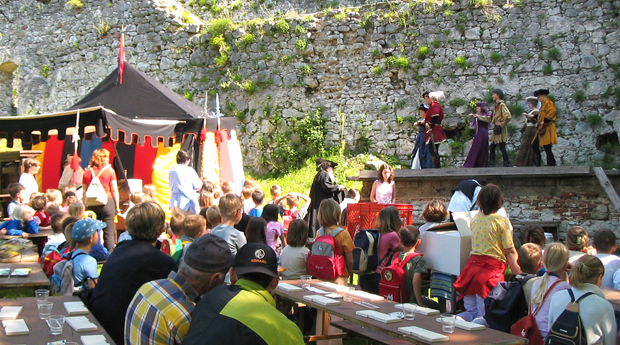 The ruins of Kamen Castle provide a magical setting for the event, which is held in a medieval style. The gothic and renaissance castle, which stands at the entrance to the Draga Valley, was originally built in the 12th century by the Counts of Ortenburg. Today only the remains of the tower and keep are preserved and can be visited anytime. 25th June at 9.00am – Guided tour of the Path of Peace in Brezje (more about Brezje can be read in my last blog).